Hi! I'm Lisa. After six years of college, I returned to my hometown in Western Pennsylvania, married my high school love, had a baby, and bought a home. We pretty much over-did it that first year, and now we are trying to simplify our lives, to eventually have and owe less in order to do and see more-- as a family. I work full time as a Physician Assistant at a local hospital. My husband, Jesse, works full time on his family's dairy farm. 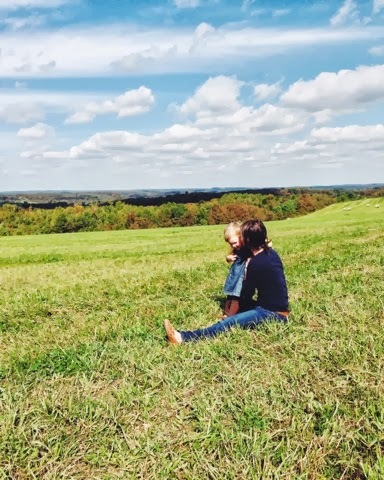 Our daughter is growing to love that farm just as my husband did at a young age, it warms my heart. I love spending time with my family, baking and creating good, healthy foods, gardening and raising food, dipping slightly into photography, taking walks along our country road, daily prayer, and home decorating/small home projects. We are mostly simple people. We live in a small town, so I'll often load my family for the hour long drive to the nearest Target and Starbucks. Oh, how I miss them. This blog is my memoir-- I tend to tweak a recipe then forget what I did and I don't document Molly's usual days well. I want to remember where we've been, so I won't forget to thank God for all He has done. I'm so glad to have you along.